An important detail, the wedding bouquet should match the bride`s dress and personality, but also the overall style of the wedding. What follow are some great ideas and suggestions for a wedding bouquet with flowers for every style, so get inspired and create your perfect bouquet. 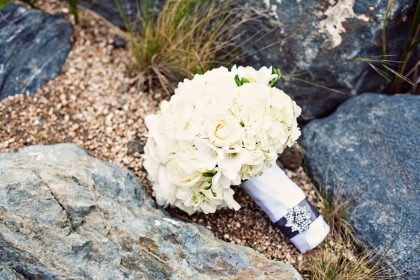 A classic choice for more formal wedding, a white wedding bouquet is delicate, feminine and simply lovely. Still, make sure you choose the right size if the bouquet and the perfect combination of flowers with different textures. Sometimes, a large and heavy bouquet can steal the bride`s look. The safe option is to choose a small wedding bouquet created of two or three types of flowers. This is definitely the best choice for brides short in stature. You can opt for an original country style bridal bouquet rendered in a casual style and featuring a harmonious combination of different shades of color. A wonderful and romantic choice, a wedding bouquet made from orchids always looks great. In order to make a strong personality statement, choose a unique wedding bouquet that perfectly reflects your own personality. To create an elegant and chic wedding bouquet, tie some tulips together with a silk bow. Lilies can make wonderful wedding bouquets, no matter if you want a simple bouquet made entirely of lilies or you wish to use them in combination with small flowers. If you want your bouquet to be in accordance with the color scheme of the wedding, make sure you choose flowers in the same shade, but never the same flowers as the rest of the floral decorations. For having an eco-chic rural wedding bouquet, opt for rural or country style flowers. For creating an elegant colorful wedding bouquet, you can choose different types of lowers with various textures, but make sure they come in complementing colors. Using the ideas and suggestions for a wedding bouquet with flowers for every style, you will surely find the bridal bouquet that suits you the best.